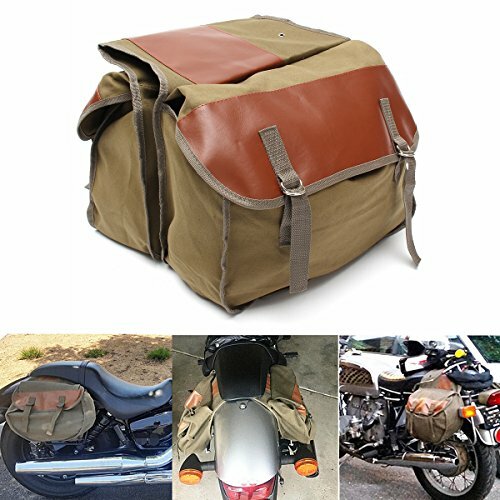 Size: 40 x 15 x 30cm/15.75"x5.91"x11.81"
Durable Material: This motorcycle saddles bag is made of good quality tough canvas and synthetic leather padding. Strong stitching, durable and sturdy. The leather surface decoration looks cool on the motorcycle. Cool Appearance: Two large pockets with double-strapped flap covers and "D" ring closures. Look very old school throw overs but if you wanted them to have more shape you could easily make inserts to stiffen the sides. Large Capacity: Capacity of 1056 cubic-Inches, you can use them carry lots of groceries. It allows you to put two empty one-gallon water jugs into each side pocket, saving extra space for you to keep more stuffs. Easy to install: It has the flexible mounting options, you even can do a little modification to sit correctly on your motorbike. Reinforced at all stress points. It also fits perfectly across the seat and doesn't touch the muffler. Wide Application: Suitable for grocery shopping or a long ride trips. Fits for Honda shadow 750, Royal Enfield bullet, Honda ctx, taotao thunder, 91' Vulcan 500, Suzuki dr 650, Harley Sportster, etc. In addition, it is also suitable for the bike. If you have any questions about this product by GEMITTO, contact us by completing and submitting the form below. If you are looking for a specif part number, please include it with your message.